I have a farm rustic/contemporary kitchen and use this cart to hold my small appliances. My kitchen is quite large with an8'peninsula. I have the cart in the middle of the floor. It allows access for the equipment throughout the entire kitchen. I've had so many compliments on it. I would recommend it because it is decorative and sturdy. 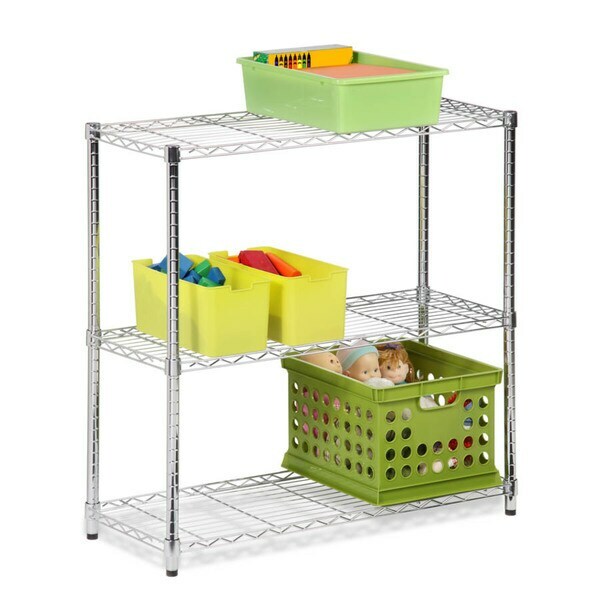 Honey-Can-Do SHF-01606 NSF Urban Shelving 3-Tier Adjustable Storage Shelving Unit, Chrome. Create visible, accessible storage space instantly with Honey-Can-Do industrial shelving systems. Contemporary chrome finish and 36" steel frame make this unit the perfect blend of style and functionality. Durable enough for the mudroom, garage, or commercial kitchen; this NSF-rated shelving for food equipment areas including refrigerators, freezers, and warewashing areas is capable of withstanding up to 200lbs per shelf. Adjustable shelves allow you to change the configuration as your storage needs evolve. Combine multiple units to create a customized storage wall. The no-tool assembly allows you to construct in minutes a shelving unit that will last for years. I used this unit (and others) to alter 6' five shelf units to 5' five shelf units and one 6' six shelf unit with a few pieces left over. The units are easy to put together, are easily adjustable and make my garage look good. Arrived quickly. I have several of these units, some larger to store groceries in my garage and utility room. I'm using this unit in a cedar sauna that we don't use in my master bedroom for sheets and towels. Very good, sturdy purchase. Exactly what i wanted. Easy to put together and very sturdy and of good quality. Put mine in a large closet to hold linens, towels, etc. in the guest room. Would buy again.